Lisa Gibson studied design by squinting at the values and patterns in many locations throughout her life. Montana has been her classroom for well over half of it. She explored creativity through photography, quilt making and pine needle basketry before learning that painting combines all of the elements she loves - color and design with a tactile, hands-on approach. Lisa's highly detailed paintings are delicate glimpses into the contrasting world of nature. Light, dark, color, and shadow play an important role in showcasing the balance of life, both in wondrous Montana-inspired landscapes and in our own selves. Her work is a refreshing reminder that our dynamic world is full of equally dark and beautiful mysteries to behold. I discovered I'm an artist in my late 40s. 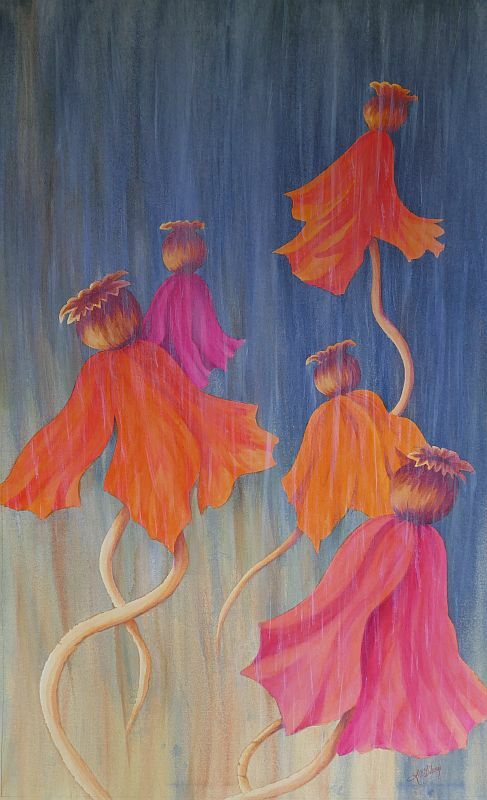 Since that qualifies me as a "late bloomer", it seems fitting that flowers end up in most of my paintings. My work begins with ideas formed from thought-provoking pod casts, books, or conversations. Oftentimes a word will jump out at me - like "thrive" - and a new painting is born out of that mental image of it. Life can be hard, and it’s far too easy to paint a dreary picture of it based on our feelings or circumstances of the moment. An important practice for me has been in deciding where to place my focus each day. Is it going to be on the sad or infuriating elements? Or on the beautiful elements that are also always there? Every day we have that choice and decision to make - some days are harder than others! It's through this intentional focus that my art is created. We all need connections to each other, our inner selves, and to nature and beyond. My art is a vital piece in that connection and reminds others to strive for a positive focus.